Persuasion only works if the person you are trying to convince is willing to hear you. To get a reluctant party to negotiate, the first step is winning their attention. In this busy world, sometimes you only have a few seconds to do so. Some people have the knack. Others do not. Here are two instructive stories, one cheerful, the other tragic. They first appeared on my LinkedIn Influencer blog in late 2013. Both were widely viewed. For different reasons both stimulated many comments. Before we turn to those examples, though, we’ll consider where—ideally—you’d like to meet your counterpart, and how you feel about having other people at the bargaining table. Now we'll analyze two real-life situations. The first involves a charismatic shoeshine vendor competing for the attention of potential customers. Read the short introduction below, then stop and consider the questions that follow. Then click to read the rest of the account. Do the same for the second story. Finish the module by reading the concluding commentary. I’ve learned a lot about negotiation from my colleague Paul Levy. I’ve talked to him about huge deals he made while managing the $5 billion Boston Harbor clean-up. After that he worked out creative agreements with suppliers, doctors, and government agencies as CEO of one of Boston’s leading hospitals. But Paul also has a keen eye for important negotiation lessons we can learn from everyday transactions. 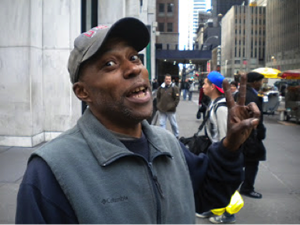 He once shared a story with me about getting a shoeshine in New York from the man pictured here. Street vendor in midtown Manhattan. Midtown Manhattan is packed with street vendors competing to get the attention of pedestrians bustling down the sidewalk. Hawkers have just a few seconds to snag a customer before they rush by. Paul was mesmerized by this guy's technique. Take a minute to complete this quick survey before reading further. Likewise, when you’re trying to draw someone into a negotiation, you’ve got to make a personalized appeal. A hawker shouting, “Shoeshines. Get your shoeshines here.” would be wasting his breath. Paul’s story illustrates three important rules for any negotiation, whether you have only a few seconds or all day. You won’t get anywhere until you have your counterpart’s attention. Even if someone’s sitting across the table from you, their mind may be wandering and not focused on what’s important to you. You’ve got to find the right bait to lure them into the conversation. Never ask questions that are easy for others to say “no” to. If the shoeshine vendor were simply to ask, “Wanna shine?” people would rush on by. Instead he makes prospects ask themselves why they would want to look anything less than their very best. These principles apply whenever you want someone else to pivot, to buy something from you—a product, a service, or an idea—that they weren’t even thinking about a moment ago. They also apply to situations where you are trying to stop someone from carrying out their intentions. In the next example, I’ll describe another three-second negotiation, this one with far higher stakes. That sounds right to me. The individualized nature of the vendor’s patter is essential. If he were simply to say, “Anybody want a shoeshine?” or “I’m the best shoe-shiner in New York,” walkers would have just streamed on by. Instead, this fellow directs his comment at a particular person, not the general public. The seller is trying to forge a one-on-one relationship. I responded by agreeing while noting that while the vendor was mocking prospects, he also expressed empathy. The underlying message was, “Let me shine your shoes and you’ll walk away with a spring in your step, feeling good about yourself.” And he is able to do this repeatedly with remarks that are shorter than a Tweet. Here’s another three-second negotiation. If you’re looking for something cheerful, though, maybe you should read it some other time. It’s a troubling story and far from most people’s experience. Nevertheless, it offers powerful life lessons. You have mere seconds to act. You’re not close enough to restrain him. What would you say? But word did get out in the following days. The whole incident had been videoed by helmet cameras. (The grainy picture posted here is from that film.) 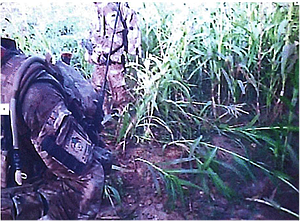 The soldier was found guilty of murder, the first such conviction in Britain since World War II. It was a tragedy all the way around. For the victim, most certainly. Also for the convicted soldier who, for what it’s worth, had an otherwise unblemished service record. And likewise for the troops who witnessed the killing and anguish over what they might have done to prevent it. Replay that short sentence in your head as if it were directed to you. Note that it does not include the words stop, order, or wrong. The omission makes the statement all the stronger. Its aim is to put the spotlight on the person, not the act. According to David, every US Marine received this training in 2012, from senior personnel to the most junior enlisted troops. It’s more than a technique or a tactic. Instead it’s an expression of a deep sense of values and responsibilities. Now let’s take a big leap to see how the same principles apply if you need to persuade someone else to do the right thing. Perhaps you want another party to treat you fairly, even though they know you’re in a weak bargaining position. Or you might see a colleague about to trip up by padding their expense account. Don’t look away; have moral courage yourself. Step one is summoning the better side of the other person’s nature. That doesn’t require sermonizing. Instead you might merely ask, “Would you be comfortable telling your children what you’re planning to do?” Start with the fundamental matter of character. After that—if you have more than three seconds—you can debate specific ethical boundaries. Most important of all, of course, is having friends who will have the courage to challenge us if we seem to have lost sight of who we aspire to be. This post drew more than 150,000 LinkedIn viewers. It received many “thumbs up,” but also drew strongly felt criticism. Some readers thought the piece disparaged the UK Marines or that I believed I would have done better under the circumstances. That certainly wasn’t my intent.